How to cure Box Blight. What you should know and action to take. Box Blight – How to treat it. With TOPBUXUS HEALTH-MIX, you can give your box plants bright green shiny leaves, preventing yellow edges and faded colours. With TOPBUXUS HEALTH-MIX, you are able to immediately stop acute fungal disease such as Cylindrocladium. An acute fungal disease is immediately recognisable from the brown points that will swiftly expand to form blemishes. The most dangerous period is when there is protracted rainfall in combination with high temperatures. If you do nothing, the diseased box plant will soon start to lose its leaves and, in the worst case, if you fail to treat it, the affected branches can die, resulting in dead areas in your box plant. The diseased plants will then unfortunately have to be replaced. 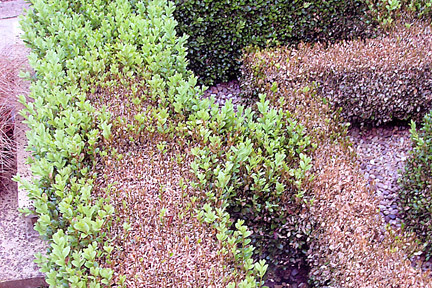 However, if you promptly use TOPBUXUS HEALTH-MIX after treatment, leaves will soon sprout on the diseased branches and recover. When the onset of disease is evident, immediately carry out the treatment. Under normal circumstances, one treatment is sufficient. It is extremely important to also immediately treat all of your healthy box plants. Should the warm and damp weather persist, repeat the treatment after 1 week. Thorough inspection is recommended in the future, particularly when the weather is warm and damp for protracted periods of time. If necessary, at a later date, you can simply repeat the treatment; this means you will continue to get maximum pleasure from your box plants. Can be used in damp weather, but preferably for use on dry foliage. One Response to Box Blight – How to treat it.